Here's my latest master granola recipe. It changes every so often, and this new incarnation features quinoa. I'm not sure if I've ever posted a granola recipe before. I always felt that there were too many in the world. It's such a simple thing! Why do we need so many recipes? Well, just like many simple things the slightest adjustment does change things. And we all like to have things just so, don't we? They say adding applesauce adds a clump factor to granola, but I'm not sure if I entirely buy that. I do like adding it for sweetness and texture though. I think the best thing to do to induce clumping is to let the granola sit after baking until it cools. I usually add a mixture of honey and maple syrup to my granola; honey for sweetness and maple syrup for a deeper flavor. Keep in mind that if you use just honey it will be a tad sweeter than maple. And of course, you can use sugar if you want, which will put the sweetness power somewhere in between the two. I've taken to adding a bit of almond extract to almost everything these days because I love it so much. FYI to quinoa lovers: I have tried to up the quinoa in this recipe and it gets too birdseed-y. You might like that, but don't say I didn't warn you. Speaking of things being just so, I don't put any fruit in my granola anymore; I like straight-up nuts. This seems silly to admit, but it had never crossed my mind until I tried this guest-post recipe at Eating Rules from Winnie at Healthy Green Kitchen. The post contains not only good advice on saving money on unprocessed food but a very reliable granola recipe to boot that has only nuts. Aha! I do like fruit with my granola, however: my favorite breakfast these days is a bit of yogurt sprinkled with this granola, with a spoonful of concord grape jam. It's amazing how happy it makes me! Mix all the ingredients in a large bowl. Spread in a cookie tray lined with parchment paper and bake in a 300 degree oven for 45 minutes, turning every 15 minutes until golden brown, and fragrant. I like to grind a little sea salt on top before it cools. Remember: let it cool fully! 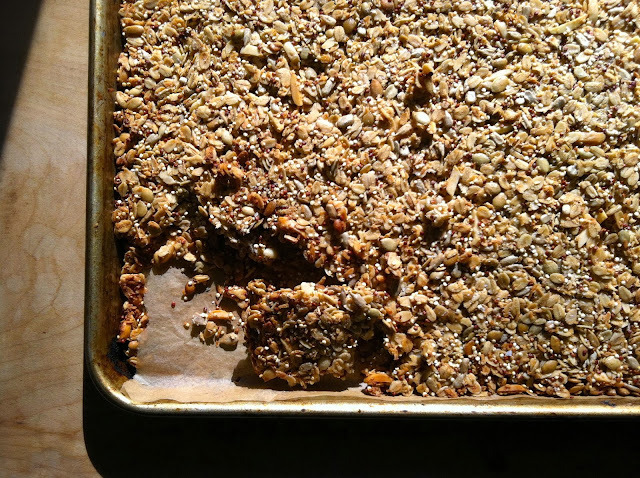 I made quinoa granola a while back and was surprised at how much I liked the crunchiness and graininess of it (the same joy came when I used steel cut oats, too). I usually make and have on hand 2 kinds of granola, one kind that never changes that the kid loves, and one just for me. This one I'll make just for me. I like it too, but when I used two cups of quinoa it got to be juuuust a little bit much (personally). I've never tried steel cut oats. That will have to be in it one day. That sounds really crunchy. My kid still doesn't like granola, so I'm lucky: I just make one kind! Have you tried making this with mushed banana or pumpkin instead of the applesauce? No, but that's a great idea, Anduin. I'm sure it would work fine. I know Kaela, from Local Kitchen, was planning on trying it with pumpkin. Have you?